Before we examine the product in question, one could just say a little thing about body immune system. Immunity is the ability of the body to resist harmful micro-organism from entering the body through multi-cellular organisms (Blood cells). The system contains two component which are the innate component and the adaptive component. The innate component are designed to recognise foreign substance and react which is called inflammation (set on fire) while the adaptive component are design to identify body substance and don’t react this is called immunity. So our health can now be seen as a state where the body is spared through the adaptive component and the disease or foreign body is eliminated through the innate component. if the reverse is the case, we fall sick. The adaptive component can be divided into two parts which is the natural and artificial component. The common example of the artificial component is the immunization or vaccination we give to our children when they are young. The artificial component is developed by deliberate action of sparing body such as vaccination from polio which deliberately prevent the body from Polio disease. Both natural and artificial could be active or passive depending on the time of there activities. Ganoderma Lucidum commonly known has linzi mushroom is widely used in Traditional Chinese Medicine (TCM). 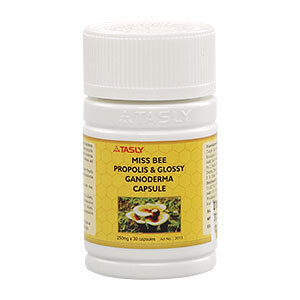 TASLY calls theirs Miss Bee Propolis & glossy Ganoderma Capsule. Orgono-Gold adds it in all their coffees. Ganoderma posses the ability to activate natural killer cells increasing the body to fight against tumours (Cancer). It reduces the chances of allowing cancer to spread to other part of the body (metastasis). They also help moderate body immune system. It has the ability to reduce immune system activity when the body is over-stimulated and bolster immune system when body is week. One thing of note about most traditional medicine is that, it could be combined with orthodox medicine and Ganoderma is not an exception. Apart from the benefit it has on the immune system, it is also an anti-oxidant and also help in fighting insulin resistance which reduces risk to prostate cancer. This is a supplement you would like to have. Other medicines which TASLY company researched to work on the Immune system are A1 capsule and cordyceps. They also could explained its effect on HIV/AIDs. The next blog on A1 capsule would explain this. Well you could also be informed on traditional Chinese medicine if you decide to acquire the app today. If you want some of the Ganoderma Lucidum supplement in coffee or capsule form please contact me privately.